This photo was taken on March 21, 2017 at 3:20 PM. The location was near the White House in Washington, DC. The "Take It!" 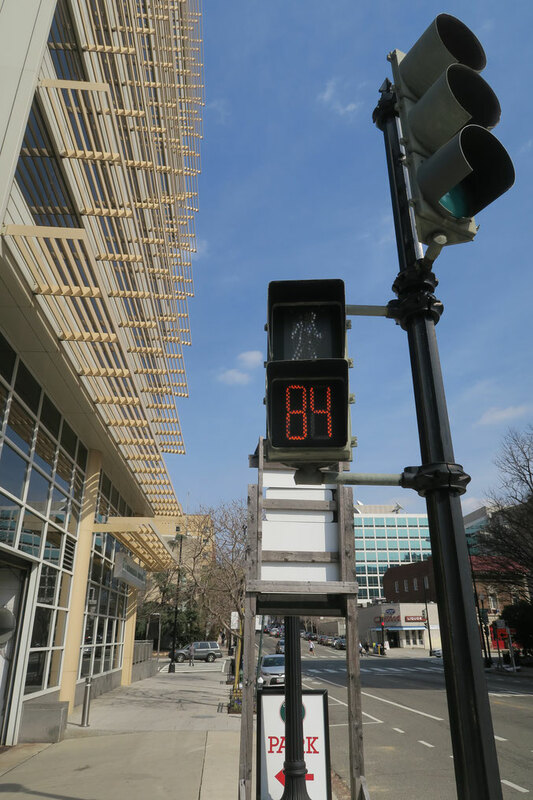 came from my earlier having encountered a cross walk pedestrian timing guide in another location that had a full 15 less as the maximum time allowed for crossing the intersection. I thought that was jaw dropping until later in the same day, I found myself looking at this larger number. In defense of the device, I stood at each intersection to watch how many different accommodations were being extended to the vehicle traffic involved. I am glad to say there were many, so that everyone seemed to get their fair chance at progressing through the intersection and thus being on their way. The After Take: I have actually been in my car at these same intersections, and did the same wait time, but never paid any attention to the mind boggling span of time consumed. I can only say that in the comfort of the car vs standing on the sidewalk there is a huge difference in prospective. Should anyone find a larger number* on a pedestrian walk way guide, please send it to me. Life is full of little surprises (and some a little longer than others - lol). * The guide signage actually started at 85, I was not quick enough to catch it. Wow, what a wait. That would drive me crazy. I think the longest I have ever seen was around a minute long. Was it a long walk across? I would think it would have to be. There used to be one in the city here that was 90 seconds. If it still is and I can find it, I'll let ya know. I absolutely cannot stand long lights and this one is almost a minute and a half long. It would be one thing if someone actually needed the time to get across, but if I was sitting there watching 85 seconds tick down with no one using it, I'd lose it. That building is really cool looking. It looks like it has a walkway on the outside of every building. Man I remember being impressed when I saw a 60 second crosswalk. It was also a very wide intersection, 3 lanes on each side.